A spectacular natural landscape formed 60 million years ago, or stepping stones built by the mythical Irish giant Finn MacCool? One of Europe’s most spectacular coastlines, The Giant’s Causeway’s spectacular rock formations consist of over 40,000 interlocking basalt columns. The Giant’s Causeway was formed between 50 and 60 million years ago by an ancient volcanic eruption. The cooling lava contracted, forming the unique “stepping stone” rock formation. The columns are mostly hexagonal, but some have seven or eight sides. In 1986, the Giants Causeway was included on the UNESCO World Heritage site list as both a cultural and natural site, one of only 25 in the world to achieve this status. Unable to comprehend how unusual and spectacular landscape was a natural feature of the landscape, our ancient ancestors believed the causeway was built by the mythical Irish giant Fionn Mac Cumhaill. 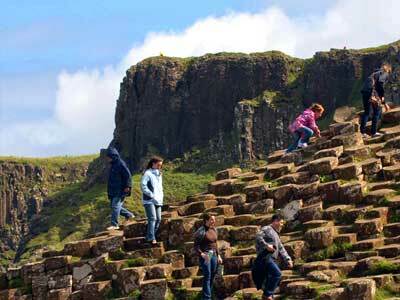 The “Giant’s Causeway” is named after the legends of Fionn mac Cumhaill (Finn McCool), the leader of the ancient Fianna warriors in Ireland. According to mythology, Fionn built the causeway as stepping stones to cross the Irish sea in order to battle Benandonner, a Scottish giant. Although a giant himself, when Fionn reached Scotland he saw that Benandonner was almost twice his size, and immediately retreated with his rival in pursuit. Fionn’s wife disguised him as a baby, and on seeing the child, Benandonner fled home fearing how enormous it’s father must be. The Giants Causeway Visitors Centre offers many amenities to visitor, including an interpretive audio-visual presentation, a souvenir shop and tea rooms. The centre caters for the interest and enjoyment of the half a million tourists that visit the Giants Causeway each year. 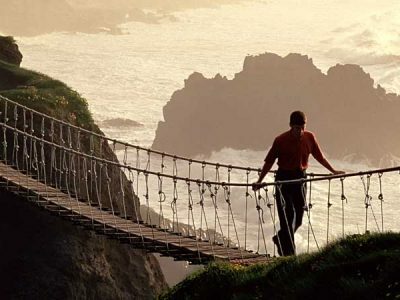 Are you brave enough to cross the rope bridge over 30m above sea level?